Customers tell us that because of the flexibility of Reminder, and the huge number of different ways in which a SharePoint installation can be set up: getting Reminder correctly set up and configured for the first time can be a bit of a challenge. To help with this, in Reminder v1.7 we have added a Setup Diagnostic Wizard that will check for many of the common set up and configuration problems for you and suggest possible configuration changes to fix them. The Wizard will check for a variety of common issues like: problems with SharePoint outgoing email settings, non-matching authentication settings or insufficient account permissions – which are all frequent causes of trouble during the set up process. 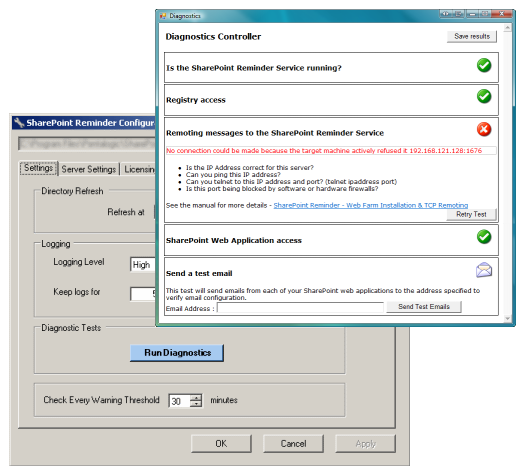 To use the Wizard, go the the Configuration Tool in the “Start Program” files, and click the “Run Diagnostics” Button. with any potential problem areas marked with a red cross and suggested remedies listed underneath in blue. For further information on setting up and configuring Reminder please visit the on-line manual. We hope this will help many users to solve simple set up issues on the spot, but if you are still having difficulties our free telephone and email support is always available. We hope you find the tool useful and we look forward to hearing your feedback.